Listed in: Caterers, Event Coordinator, Event Design, Party Catering, Party Planner and Wedding Planner categories. Get more for your wedding! 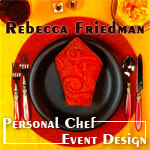 Don't forget to mention ChossonKallah.com when visiting Rebecca Friedman / Personal Chef & Event Planner. Rebecca catered our wedding a little over a week ago and it was fantastic! Everyone commented on the food. She made everything kosher to the standards we needed, organic, fresh and so delicious! She also gave us advice and helped us find a beautiful hall, order tables, chairs etc., and even decorated the cake beautifully! Hire her! You will not be disappointed.